Law firm email marketing is a great way to communicate with current and future clients. But there is more to it than simply sending an email every so often. Are you sending on the right day or at the right time? Are your subject lines effective? Is your design interesting? Could your content generate more opens and clicks? One way to answer these questions and more is to start doing some A/B testing. Basically, this is a way of seeing which of two options will be most effective. 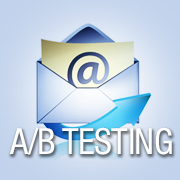 A/B testing randomly splits your email list into two different groups – one that will receive Version A email and one that will get Version B.
A/B testing your law firm email marketing campaigns gives you the opportunity to maximize conversion rates, solve problems and determine a set of optimized practices that work best for your firm. Here are three easy tests to run that should improve your open and click-through rates, drive more traffic to your website, and generate more leads from the visits you get. 1. What is the best day and time to send your email campaign? Here is a simple, but valuable, test. Figuring out the best time and day to reach your audience when they are actively engaged with their email will positively affect overall campaign response. While there are many studies that will tell you what the optimal time is to send a campaign, the truth is it really depends upon your industry. You should first consider your audience: Will they most likely open and read an email during work hours or at night or on the weekend? Begin by doing a send on two different days to see which one is more successful. Once you have the day narrowed down, try testing a morning and afternoon or evening send time to determine the optimal time for your audience to open your email. 2. What subject line works best? Here are a few subject-line testing scenarios. Brand name: Do you get a better open rate if your firm name is in the subject line? According to some studies, adding a company name to a subject line can increase open rates by 30 to 60 percent over a subject line without branding. Do you need to include the firm name in the subject line when the sender line also uses the brand name? Seems redundant, but you won’t know if it makes a difference until you test it. Shorter vs. longer: Typically, subject lines are kept at a maximum of 45 characters, which is not incredibly long to begin with. But some research shows that even shorter subject lines result in better conversion rates. Try paring your subject line down to 35 characters or less and see if your open rate improves. Subject line content: Does mentioning a current event in the subject line increase open rates? We at Jaffe PR wondered this ourselves. For our October 23, 2013 “Miley Cyrus” edition of the Jaffe PR Newsstand, we tested two subject lines: one with “Miley Cyrus” front-loaded in the subject line and the second with “Miley Cyrus” buried at the end of the subject line. What did we learn? Well, first, Miley sells regardless of where she’s put – both subject lines performed well. However, the front-loaded subject line ended up with more opens, more clicks and a higher click-through rate. 3. Is it better to have your law firm name in the “From” (or Sender) line or a firm representative’s name? Who is your email coming from? Turns out, the sender name can make a big difference in open and click-through rates. Evidence shows that emails sent by a real person are more likely to be clicked on than emails sent from a company name. Would your firm get the same result? Run a simple A/B test to find out. Do you have any examples of any A/B tests that you have run recently? I would love to hear about your results! Do you need help designing some A/B tests to improve your campaigns? Leave a comment below or feel free to contact me at jfaivre@jaffepr.com or connect on Google+.